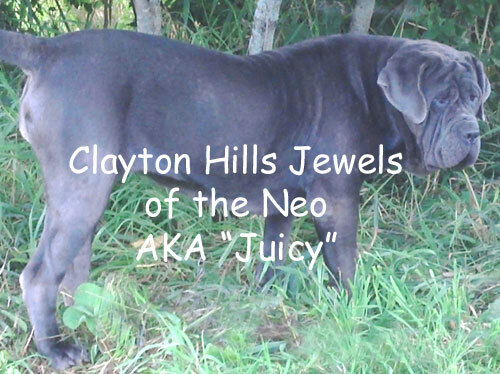 Clayton Hills Jewels of the Neo: Also known as Juicy. 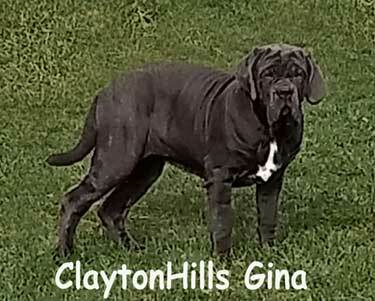 She is one of our bred-by's, coming from our Clayton Hills Amazonia X Clayton Hills Guido. She has a wonderful, playful temperament and all of the block-headed beauty of her ancestry (our Sophia, Dooley, Olivia, and Oberon). 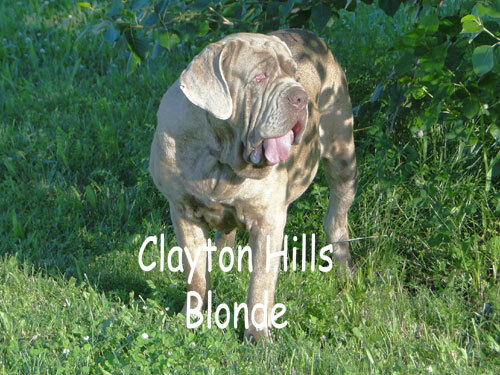 Clayton Hills Blonde El Grande: Blondie is our beautiful tawny female. She's super big and super cuddly, reminding us so much of our Dooley. She comes from our (retired) Guido X (retired) Contessa, making her a wide-bodied, thick wrinkled gal with a heavy dewlap. 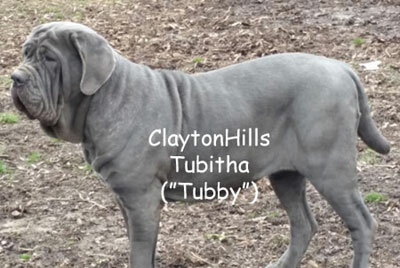 Clayton Hills Tubitha: Also known as Tubby. She is one of our bred-by's, coming from our Clayton Hills Oliva X Maximum's Zeus. She is a beautiful blend of her parents, both playful and 'snuggly'! 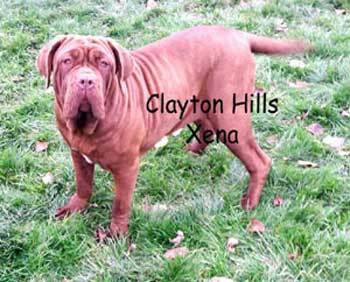 ClaytonHills Xena: Xena is from our (retired) Maximum's Zeus and (retired) Clayton Hills Isabella. She is such a beautiful, mahogany blending of her parents - with amazingly soft fur, deep family devotion, and cravings for hugs and loving! She is a total sweetheart! 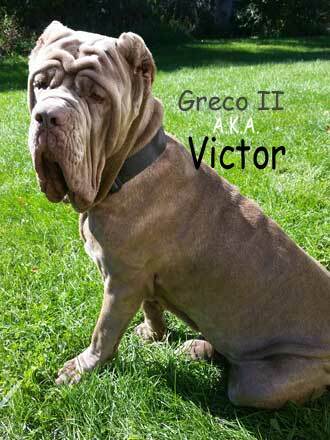 Greco II: Also known as Victor-Riko-Suave (Victor) is our new stud. He comes from Millsap Mastiffs Bodacious Beau X Peaches Morton. Victor is a goofball, with a friendly and playful temperament. He loves his 'ladies' and his blanket! 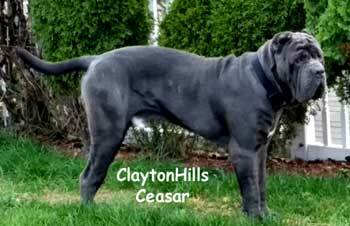 ClaytonHills Ceasar: Ceasar is from Tiberio X Nakisha Angelina Cameron (Cameron's Mastiffs). Our goal with adding Ceasar to our family was to add another strong, healthy ancestry of unrelated Neos. He is large-framed with giant feet. A playful, energetic boy, who also enjoys a nap in the sunshine. He keeps a watchful eye on all in his domain, and loves to play with the girls. ClaytonHills Gina: Gina is one of our bred-by girls, coming from our Juicy X Victor. She's got some great mass and wrinkle growing. Along with her sweet, cuddling nature and her amazing coat, she's an awesome snuggler! ... And here we are, with our Neo family. Neo puppies have got to be the CUTEST puppies on Earth. So, now and then our girls have a few. Oh how I love delivery day ... the girls are all great moms, but I sit in the whelping box with them, cheer them on and help if they need me. Site designed by Kris at Clayton Hill Neo's.